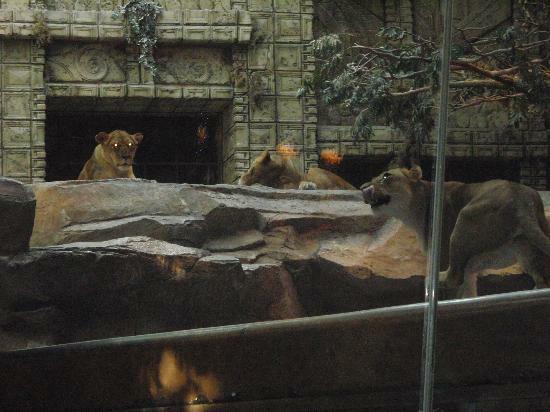 Lion attacks trainer at the MGM Grand Casino on September 1,2010...caught on tape! While Titus was recording the lions in their enclosure, the lion suddenly lunged at one of the two trainers that were in the lion’s habitat, and continued to record as a struggle ensued between the lions and the two trainers. After a short struggle, one of the trainers was able to free himself, and come to the aid of his training partner. The camera is focused on the other side of the enclosure and does not capture the moment when the man was attacked. But reports say the trainer may have stepped too close to the lion. It is being reported by the casino that the lion was temporarily removed, but is now back on display at the popular casino, but the attack is under investigation by the US Department of Agriculture. The good news is that cats and humans were not harmed during this altercation, which is a much better outcome than the infamous lion attack in Las Vegas on Siegfried & Roy in 2003,while the magical and popular duo were on stage at a casino,performing their act. “The cat had no intentions of doing permanent damage. It wasn’t hungry. It wasn’t anything like that. It was just a quick signal”,stated feline expert Keith Evans. It is good news that no one was killed or permanently injured like Roy Horn,and maybe this will encourage the Las Vegas casinos to re-evaluate if an animal enclosure housing wild lions is an appropriate attraction for a casino. It seems to me that a wild animal habitat is a better place for the lions, as well as the public.It must make the lion’s a little crazy to wake up everyday to realize that they actually live inside of a smoky casino! …What do you think?? ?…write a comment and let me know! Depressed Lions inside a casino?! ?...notice the reflection from the slot machines! The lions don’t live at the casino. They live on an 8.5 acre facility and different ones are brought out each day, so they’re not there every day. ..simply a slave in humiliation and disrespect? I just do not agree with them being held there for our entertainment, but I understand that many may not care, as is their right. I am really glad these two men did not have serious injuries. I was impressed that the female jumped into the fray seemingly to help the trainer. I wondered if they are mates. This entry was posted on September 8, 2010 at 6:24 pm and filed under Entertainment News,Social Politics. You can follow any responses to this entry through the RSS feed. « Cruel And Callous Ohio Man Allowed Bedridden Wife To Be Eaten By Millions Of Wormy Maggots!!! !….A Medieval Style Torturous Death!! !